If you have a good cause, we would love to help you to realize your goals. All of us at Chilly Treats are very proud to be a part of the Brunswick County community and would love the chance to help give back to the place that we call home. If you are looking for unique & exciting fundraising ideas, Chilly Treats may have just the answer you've been looking for. We realize when fundraising you don't have a lot of money to invest. With NO money out of pocket for you, Chilly Treats will deliver and set up a fully stocked cold plate push cart to your event or fundraiser. The cart will keep frozen for up to 8 hours without electricity, making it perfect for remote locations. Keep up to 25% of the total profit depending on menu items chosen! Your organization will only be responsible for providing a server to handle sales & what inventory is gone at time of pick-up. For large charity events or festivals we can make the Chilly Treat Truck available to you, fully stocked with drinks, ice cream, and snow cones, & server. We will donate up to 20% of total sales to your cause with zero responsibility on your behalf! 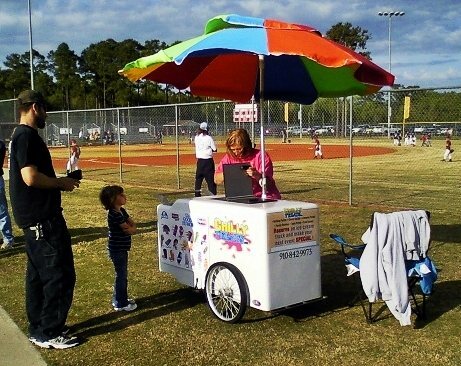 The Chilly Treat Truck does many events throughout the year & gets booked up fast. We would love to help out, so if you have questions & are considering having Chilly Treats be a part of your fundraiser, please contact us as soon as possible.